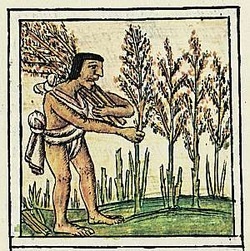 Caddos (Gulf Coast) and Jumanos (Mountains and Basins) grew crops (specifically corn) to provide for their tribe. Excess was traded with neighboring tribes. *Bartering – Native Americans traded goods that they had for goods that other tribes made. Each group of Native Americans made goods conducive to their environment. *When nomadic Texas Indians had excess hides or products made from animals, they would barter or trade with neighboring tribes. *Sedentary tribes like Caddos made jewelry, pottery, and tools to trade with neighboring tribes. 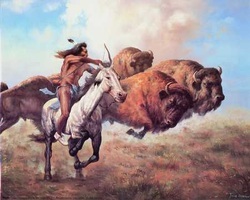 *All Indians hunted and gathered their food to meet the needs of their tribes. If there was excess, they would barter or trade with neighboring tribes. * Nomadic Indians such as the Indians of the Great Plains and North Central Plains hunted buffalo, deer, and other animals to meet their basic needs of home, clothing, and tools. *Karankawa, Caddo, and Jumano Indians, who were more sedentary, hunted small animals and fished. Their environment lent itself to this type of hunting and gathering.